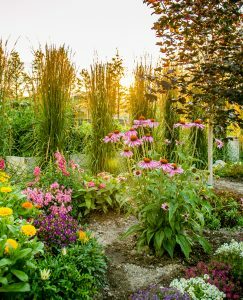 The Rotary Gardens in the Village of Radium Hot Springs … Take an evening stroll through the flowers or bring your morning coffee and relax in the gazebo as the sun warms the foliage. Located on Columbia Avenue behind the Kootenay National Park Administration building in Radium Hot Springs, the Rotary Gardens were built by volunteers during the fall of 2014 and spring of 2015. The Radium Rotary Club championed and raised funds to build the project. Run by community volunteers, the Rotary Gardens include a central public garden and 40 raised vegetable gardens that are rented, planted, maintained and harvested by Radium residents. 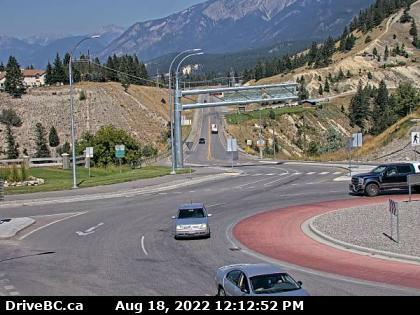 The Rotary Gardens in Radium Hot Springs are open to the public during the snow-free season. Visitors are welcome to stroll through the gardens, relax in the peaceful setting and admire the plants located throughout the gardens. The public gardens feature a gazebo, picnicking area, benches, and numerous annual and perennials surrounding a boardwalk trail. Annual flowers are generally planted in the public garden early to mid-May each year and perennials start to bloom as soon as the snow melts and temperatures rises. Tulips, alyssum, bleeding heart, silver mound, roses and many other flowers feature predominantly throughout the public gardens and line the boardwalk. Throughout the summer, stunning colours will delight your senses and weekly changes to the garden provide a reason to come back. Individual vegetable gardens, encircling the common garden and boardwalk are rented and maintained annually by residents. These unique garden beds showcase different styles of vegetable gardening. Wander through and admire the garden ornaments, plants and styles. Remember picking vegetables from these gardens, camping and bring dogs into the gardens are prohibited. Since being built in 2015, the Rotary Gardens have gladly hosted family picnics, weddings and art shows. The Rotary Gardens are a Village of Radium Hot Springs asset. Requests to use the gardens for special events can be made by emailing rotarygardensradium@outlook.com. A signed Facility Rental Agreement, Liability Insurance and rental fees are required to rent the gardens. Rental information is available on the Village of Radium Hot Springs’ website, www.radiumhotsprings.ca, or by calling the Village office at 250-347-6455. Post-event clean up is also a requirement for renting the space. Go for a walk, enjoy the scenery and while you are in the Rotary Gardens don’t forget to stop and smell the roses.